This funky doggie sweater is perfect for your little one. It's knit in sage green with black fuzzy trim. 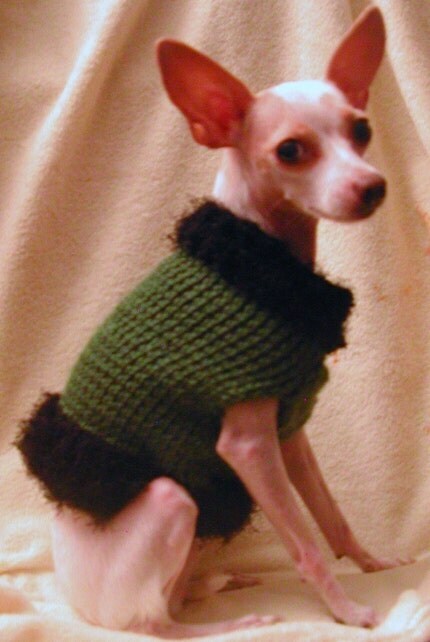 Bess, my lovely model, is a 7lb chihuahua, which will give you some idea of the size. Neck measures 8 inches but stretches nicely to get over the head. Great for all those holiday parties that you and your little one might attend. Warm and stylish, but I do have to warn you that the other dogs might be a tad jealous. Machine washable too! Just in case they have too much fun. Free shipping for US and Canada, $5 for everywhere else. Folksy :: Buy "Bubblegum Pawpaw Sock Dog"